If you follow me on Instagram, you might have noticed that I'm using a new hashtag. That hashtag is #cooknewthings. I love to cook for my blog, but sometimes I make things that don't make their way to the recipe section. I use #cooknewthings to tag everything I make, including recipes I create just for myself. Two months ago I decided that this hashtag would also be the inspiration behind a monthly cooking challenge. I started it so I would keep cooking new things, but also so others could join me! May's prompt was pesto, but not just basil pesto because I think we're all really familiar with that one. This month was about making a pesto you've never had before. 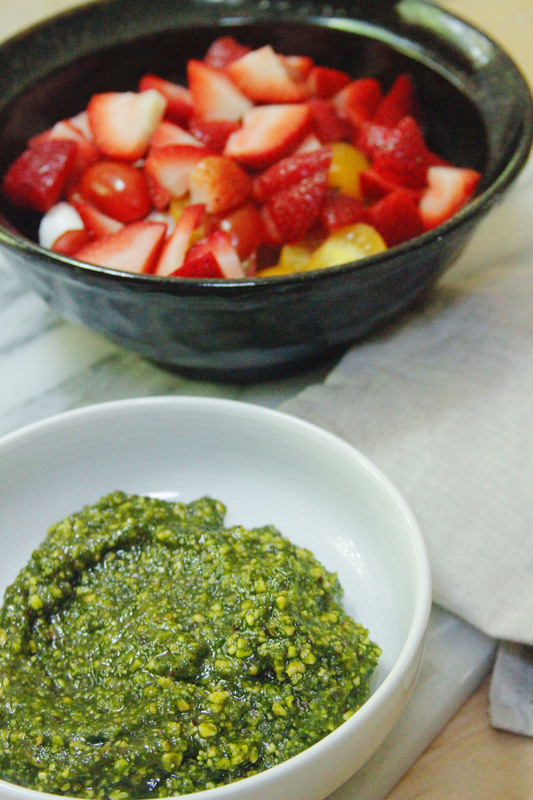 I chose to make Jessica Merchant's strawberry caprese with pistachio pesto. The bulk of the pesto is, you guessed it, pistachios. 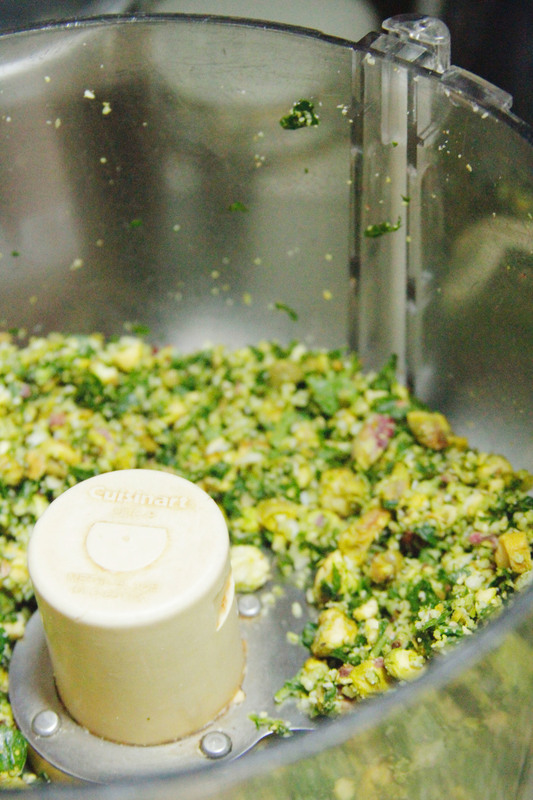 First you pulverize the pistachios with basil, mint + other typical pesto ingredients. It's a thicker pesto, but you can always thin it down with more olive oil + herbs. And then you can go the further step + pair the pesto with cherry tomatoes, strawberries and fresh mozzarella balls. OH YES. And by oh yes, I mean it's fresh, sweet, nutty + all around a great combination of flavors. This pistachio pesto is just the beginning of more experimentation. I'm thinking an orange + mint pesto with lamb ragu or a sun-dried tomato one with chicken thighs is next. You see where I'm going. I encourage you to join the #cooknewthings challenge, which you can right here. Sign up so you can hop on June's challenge!